Jan. 2 Owner contributed Rs. 50,000 and a new computer costing Rs. 20,500 to start her business. Jan. 4 Office supplies were purchased on account for Rs. 4,000. Jan. 10 Creative Advertising obtained 12% 5-year loan of Rs. 20,000 from the bank. Jan. 12 Creative Advertising paid the utility bills for Rs. 2,750. Jan. 15 Paid the Rs. 3,000 in Accounts Payable from the purchase of office supplies on Jan. 4. Jan. 24 Advertising services completed in January were billed to clients Annies’ Flowers at Rs. 18,300. Jan. 27 Creative Advertising received Rs. 5,500 from Annies’ Flowers, a client, as payment on account. Jan. 30 Miss Abida Masood withdrew Rs. 6,000 of cash for personal use. Requirement: Your are required to pass Journal Entry, post to appropriate general ledger account and make a trial balance? 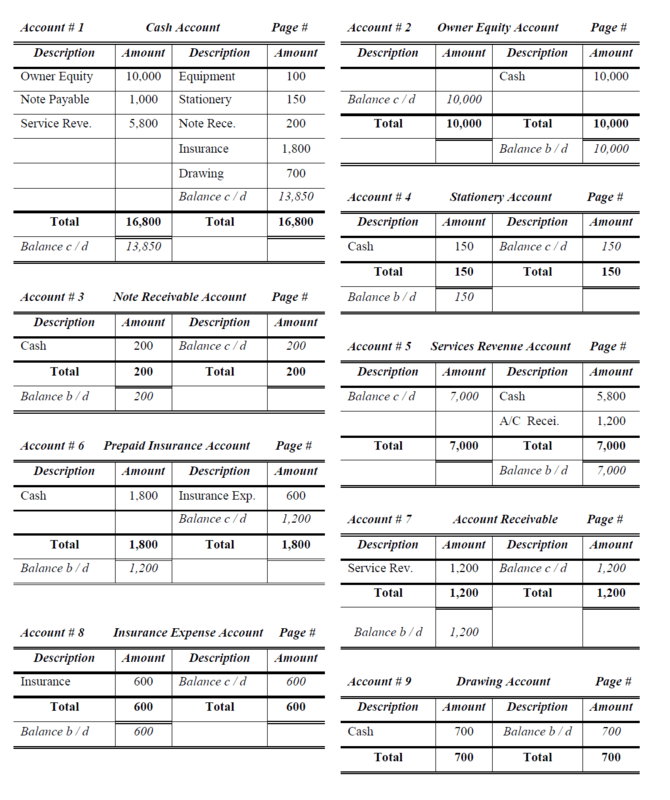 >> Read General Ledger chapter. Oct. 2 Purchased inventory on credit terms of 1/10 net 30. FOB shipping point, for Rs. 3,000. Freight charges on the purchase were Rs. 150. Oct. 9 Sold garden supplies on credit terms 3/20 net 30, FOB shipping point, for Rs. 4,000. The cost of the supplies sold was Rs. 2,500. 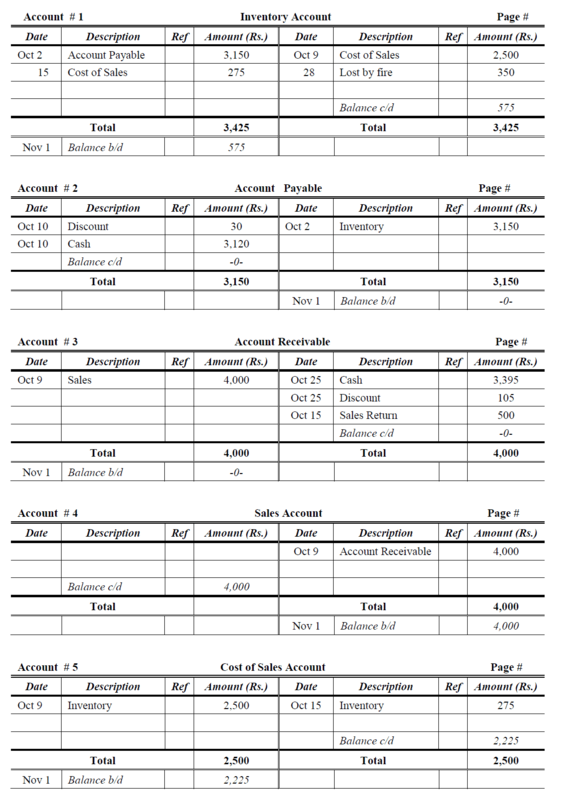 Oct. 10 Paid the amount owed on account for the Oct. 2 inventory purchase. Oct. 15 Received merchandise that was returned as defective, originally sold for Rs. 500 on Oct. 9. The original cost of the supplies returned was Rs. 275. Oct. 25 Received payment on account for the Oct. 9 sale less the appropriate sales discount. Oct. 28 Inventory lost by fire of cost Rs. 350. 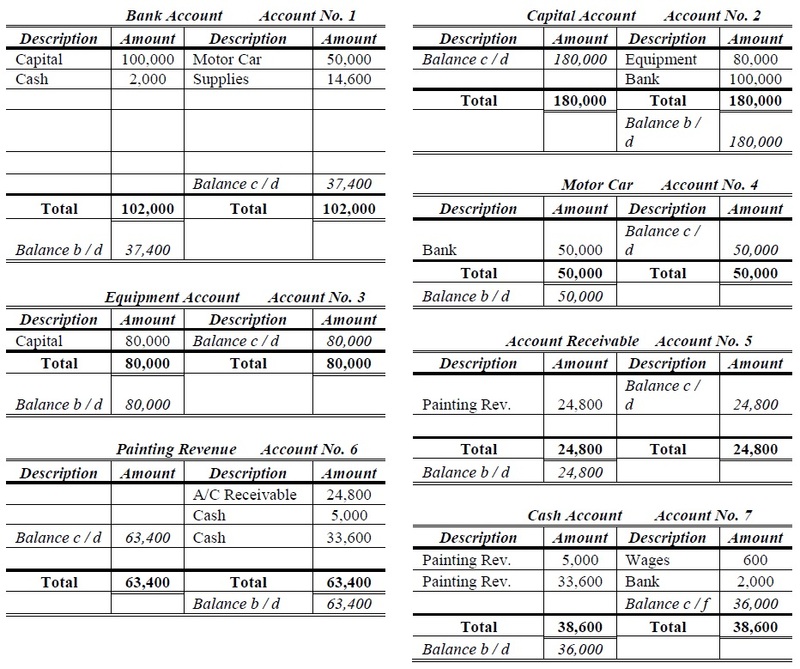 >> Practice Journal Entry Problems and Solutions for better understanding of General Ledger Problems and Solution. 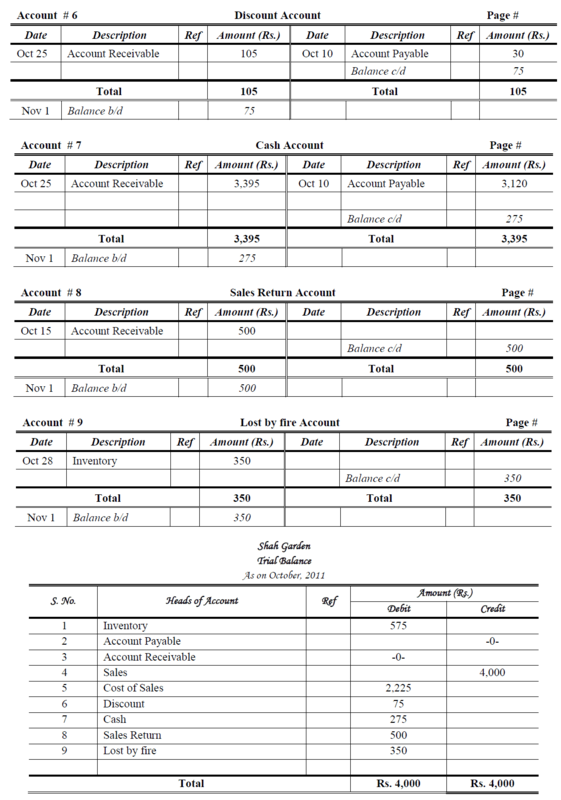 Record following transaction in T accounts directly? 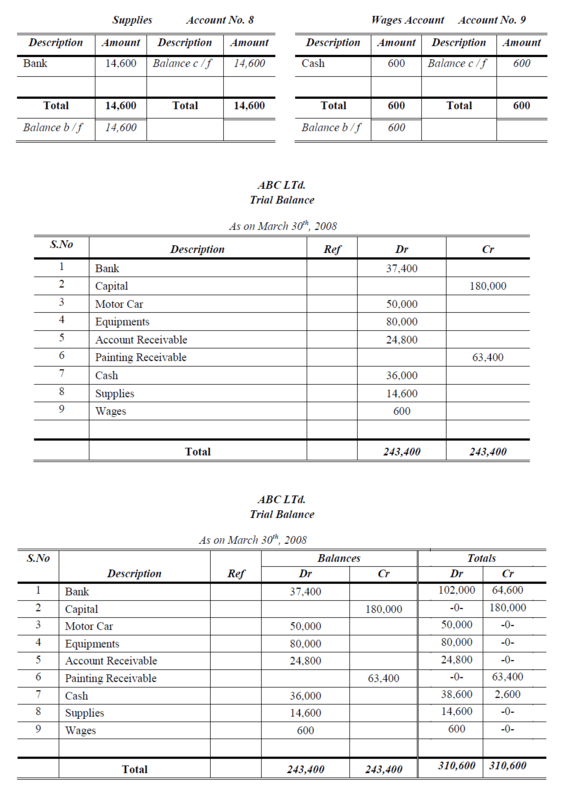 >> Practice General Ledger Mcqs for conceptual understanding of General Ledger. 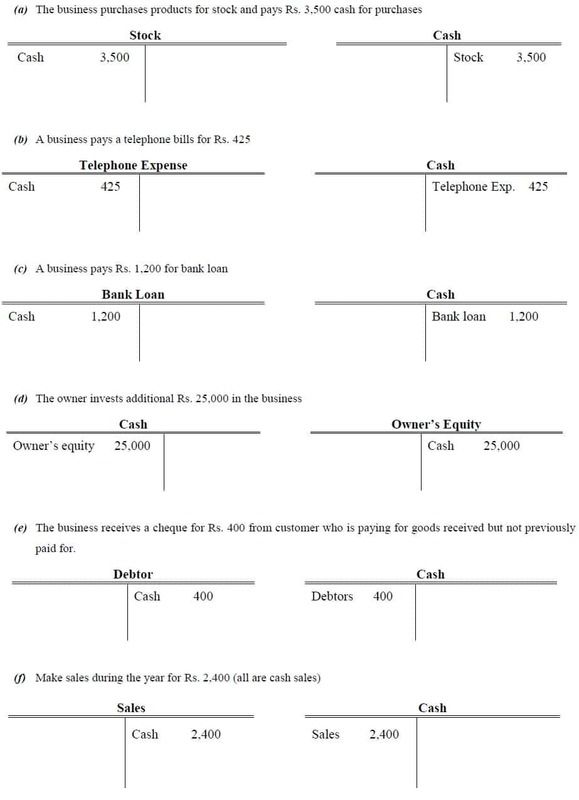 >> Basic Practice for Accounting Equation Problems and Solutions. 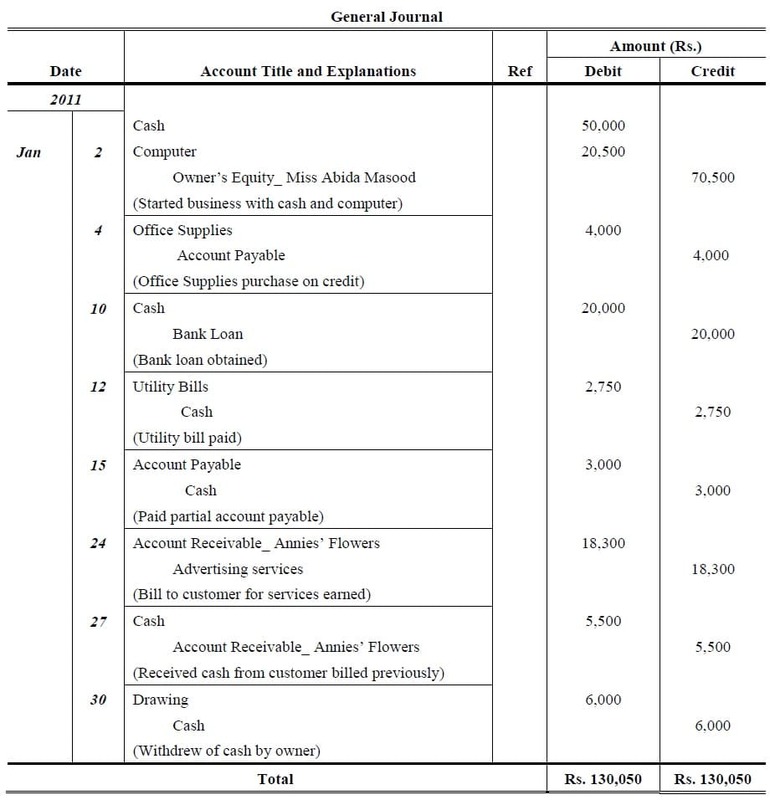 Ahmed Bajwa, an interior decorator, completed the following transactions during the month of March 2008. Begun his business with Equipment valued at Rs. 80,000 and placed Cash Rs. 100,000 in a business Bank Account. Purchase a used Motor Car costing Rs. 50,000 and paid by check. Completed painting a two-story house and billed the customer, Rs. 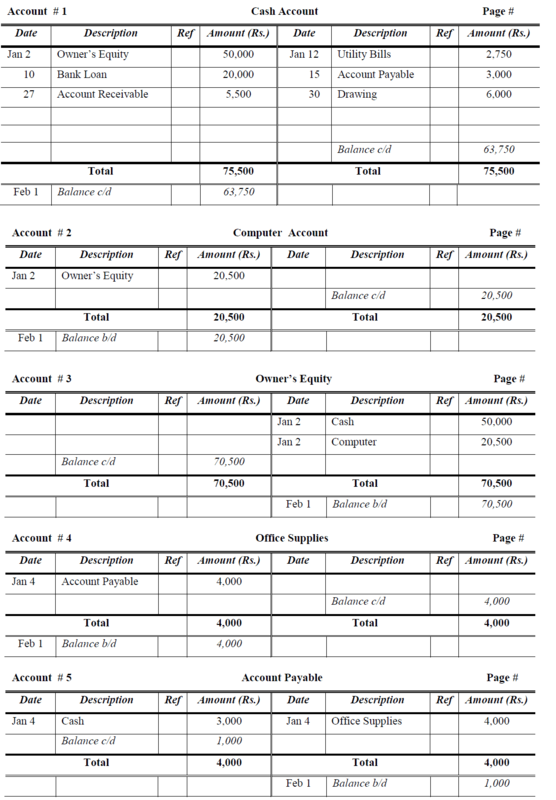 24,800 (Account Receivable Dr). Received cash for painting two rooms, Rs. 5,000. It was kept in cash till. Hired assistant to work with him, to be paid Rs. 100 per day. Purchase supplies for Rs. 14,600 and paid by check. 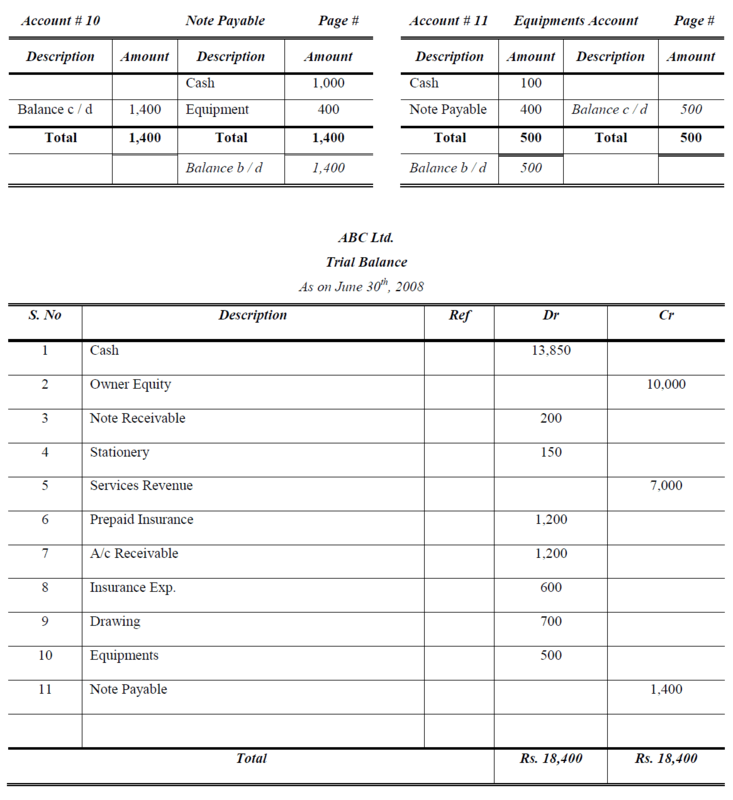 Paid assistant for six days work, Rs. 600 in Cash. Received cheque for painting five room apartment Rs. 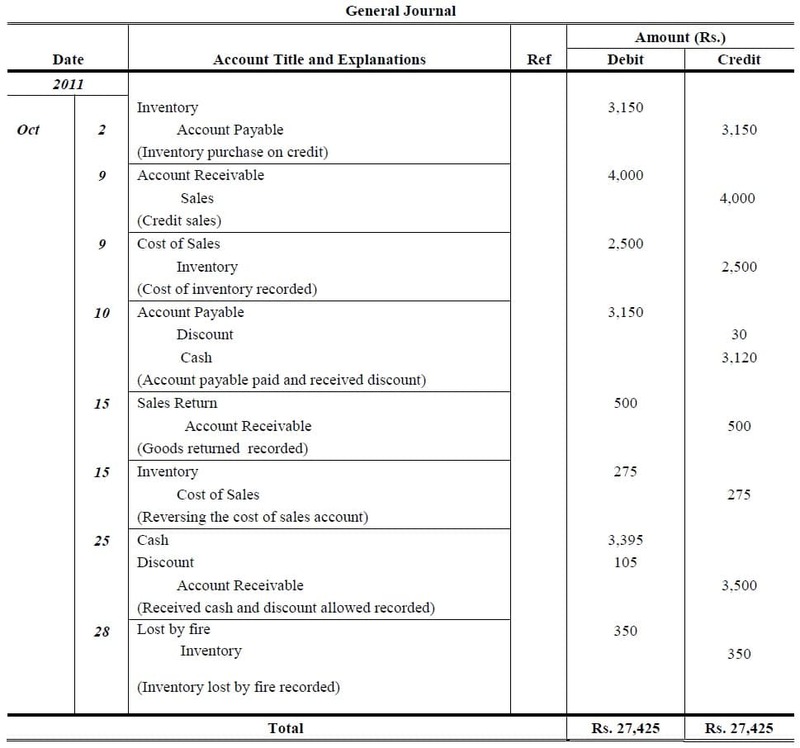 33,600 and check is not deposited. Transfer Rs. 2,000 to Business Bank Account. 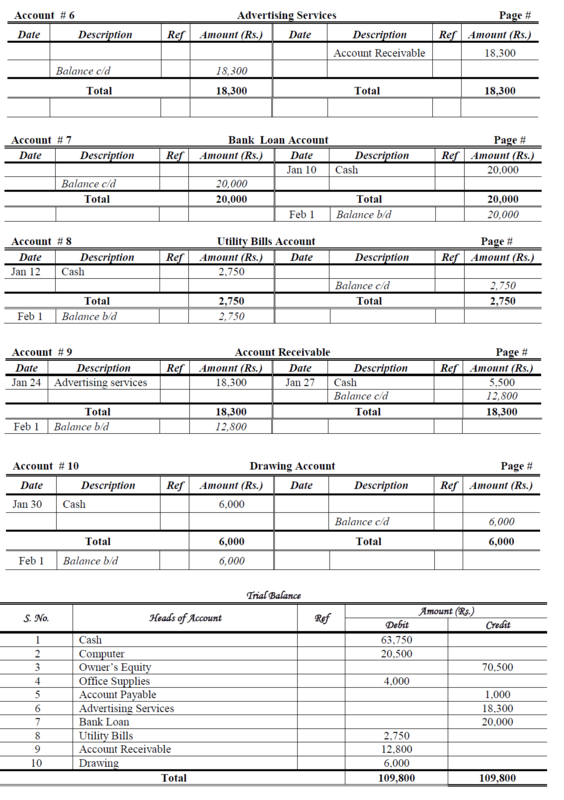 >> Read Books of Accounts chapter. Good day very cool site!! Man .. Beautiful .. Superb .. I’ll bookmark your site and take the feeds additionally…I’m happy to find a lot of useful info here within the submit, we’d like work out more strategies on this regard, thank you for sharing.